I collect teapots. Sort of. It’s a collection that just seemed to happen over the years… starting with a number of antique teapots that became mine when a family estate was settled. People who knew I “collected teapots” gave me more old teapots. I bought a few and others were gifts. Most of the teapots in my “collection” are quite old. And then there are these two “vintage” turquoise teapots that were given to me over twenty years ago by a very elderly aunt. 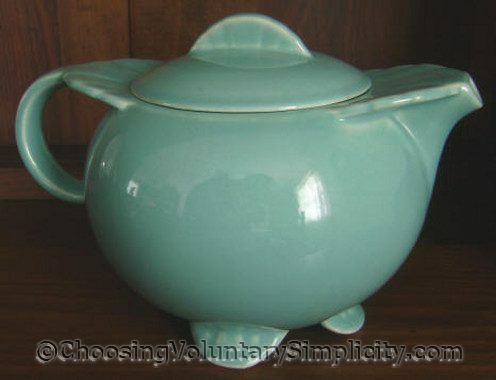 It was easy to find information about one of these turquoise teapots because it is Fiestaware. This particular teapot was called a “large teapot,” identified by the perfectly round shape of the handle and the fluted knob on the lid. This teapot has the lowercase “fiesta” mold mark and was made by the Homer Laughlin China Company sometime between 1936 and 1946. Because the large teapot was discontinued after a relatively short production run, it was only made in the original six Fiestaware colors (red, yellow, light green, ivory, cobalt, and turquoise). I have read that the large teapots in ivory and turquoise are now harder to find than the other colors, but it was still a surprise when a collector recently offered me $400 for this teapot. My answer was no, but I’m pretty sure my aunt’s answer would have been a very quick yes! The other blue teapot seems more of an aqua color to me but it could probably also be called turquoise. The body of this teapot is very round, fat… and low. This teapot sits on four “feet” and has an unusual flat extension on each side of the top opening where the lid rests. There are no mold or other identifying marks on the teapot or lid. This teapot probably dates back to the same era as the Fiestaware teapot… but because of my aunt’s age and circumstances, I suppose it could be older than that. Are you sure that the second teapot isn’t Fiesta Ware too? The color looks like a Fiesta Ware color to me. Even though I agree the shape is different. Nice post. This probably won’t help but I think the fact that your teapot doesn’t have any markings might mean it is older than you think. I know there was a date beyond which imported items had to have marks. I’m not sure about domestically made items but thought I would put it out there for you to consider. I hope you find out something about your teapot. 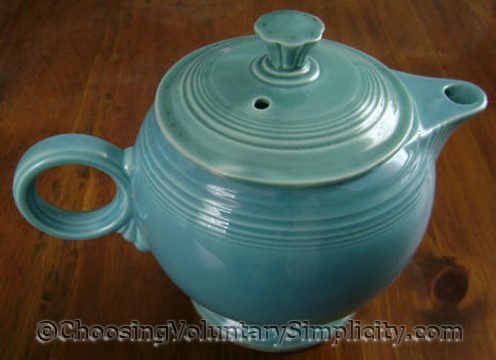 I just looked through an online catalog of antique and vintage teapots and I didn’t find anything like this either. Have you shown it to an antique dealer? 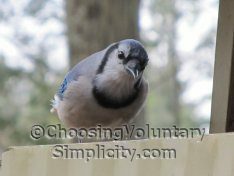 It seems distinctive enough that someone should know what it is. Nice photos btw. Love that title! Really really clever. Can’t add any more information than that, sorry. Yes, the Fiestaware teapot does have “Made in the U.S.A.” just under the Fiesta mark. It doesn’t show up well in the photo. The second teapot is from a competing line called Caliente. It was produced around the same time as Fiesta by Paden City Pottery. Each dinnerware line of the time had thier own answer to Fiesta. I have the same teapot in cobalt blue and orange/red. Hope this helps! Kurt, it certainly does help!!! Thank you so much for telling me about the Paden City Pottery company and that my teapot is from their Caliente line. I am so pleased to finally have some information about this “other” teapot. I looked this up on eBay to see if there was anything like it. I found a Caliente Pottery Shell Craft casserole with cover in an orangy red. Just beautiful! The handles are just the same as your tea pot! Like a shell! I collect 1930s/1940s pottery from Japan. The design I collect no one knows what it is call or who made it. I have researched the web, books – no information. It is very art deco and has just a simple backstamp of 3 sprouting seeds of some kind. I did find out that after Pearl Harbor, many families simply threw all their china, figurines, etc. made in Japan into the trash. How sad, but understandable in a way. I’m nutty for pottery and have been coming back to this post to see if anyone could give you information. I’m so glad for you that Kurt knew and posted here.